Spectrum's LED segment timers are versatile, easily transported and durable. They offer multiple functions and settings to accommodate multiple sports. EB1 Timers offer one-sided displays, while EB2 Timers offer two-sided display, and EB3 Timers have a running four-digit clock, showing the time remaining in the current practice segment. The EB3 is also popular for use in weight rooms and swimming pools, for track training and as a backup clock for any sport. 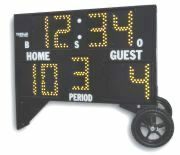 Fair-Play Scoreboards' PSO-6900-2 is designed for outdoor use with multiple sports in mind. From scoring soccer or football games to baseball, outdoor basketball and even water polo, Fair-Play has you covered. The high-contrast amber digits are 10 inches tall, some of the largest you'll find on a portable scoreboard. Its lightweight wheeled design moves easily on outdoor surfaces, and it operates from a standard 120-volt outlet or optional battery with long-lasting LEDs for durability and wide-angle viewing. It averages six hours of battery life with a full charge. For scoreboards that are easy to use with LED digits that are highly visible, consider Daktronics. When parks manager Bill Ference was looking for scoreboards to improve the complex at Freedom Park in Leesburg, Va., he talked to a local high school about its Daktronics scoreboard. He installed four of Daktronics' BA-1018 LED baseball scoreboards and an FB-1424 LED football scoreboard. 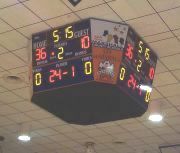 Sportable Scoreboards is one of the country's leading scoreboard manufacturers and an originator of wireless remote control for scoreboards. The Sportable scoring equipment comes in a variety of displays including light bulb and 100,000-hour rated super-bright LED numerals. Outdoor LED scoreboards are also now available. Customers include most of the NFL and many NBA teams, as well as major colleges and universities, high schools, park and recreation departments, youth leagues, corporate recreation leagues, military bases, and thousands of other organizations. For more than 30 years, Colorado Time Systems has been a system of choice for sports timing and scoring. CTS offers a timing system for almost every sport including swimming, basketball, football, baseball, track, soccer. Colorado Display Systems, the display division of CTS, has a wide variety of displays including full-color video, tri-color or monochrome animation, ribbon boards, and sport-specific scoreboards. High-quality, state-of-the-art displays are available for indoor or outdoor use. Whatever your timing or display needs, CTS can provide a solution. Swimware Aquatic Scoreboards are available in one-line to 10-lane displays. Bright LED characters are visible indoors or out and are protected by a nonglare lens. Alphanumeric boards display events, team codes, names, splits, cumulative times, finishes and messages. Alphanumeric boards come with your team's custom-designed logo, while affordable Numeric Boards show lane, place and time. To control the boards, use your PC and International Sports Timing software, including Timeware and Hy-Tek's Meet Manager for swimming and diving, Poloware for water polo matches, and Workware for workouts. All boards are lightweight, easy to install and have a five-year limited warranty. 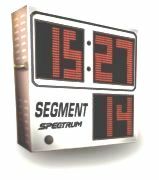 The Multisport outdoor LED Model 3502 is ideal for customers who require only the timing, scoring and period information on their scoreboard. The cabinet is aluminum and has a loud, solid-state horn built-in. Numerals are 18 inches high, designed into seven-bar segments, and the long-lasting LEDs emit less heat, use less current and provide excellent visibility from virtually any angle. Nevco scoreboards are UL-listed and CSA-certified for safety and come with a five-year guarantee that includes parts and labor. Increase excitement and the competition level on your playing field with All American Scoreboards' new outdoor portable scoreboard. The versatile, slim unit weighs only 28 pounds and is easily transported in the trunk of most midsize vehicles. Scoring information is displayed on easy-to-read, 7-3/4-inch, bright-yellow digits, which intensify in brightness as ambient light increases. A common power-tool-style 9.6-volt rechargeable battery lasts for more than 25 hours and recharges in 45 minutes. Control the unit with a hand-held wireless remote. The rounded case and laminated digit assemblies are extremely durable and impact-resistant. The scoreboard comes with a two-year limited warranty.